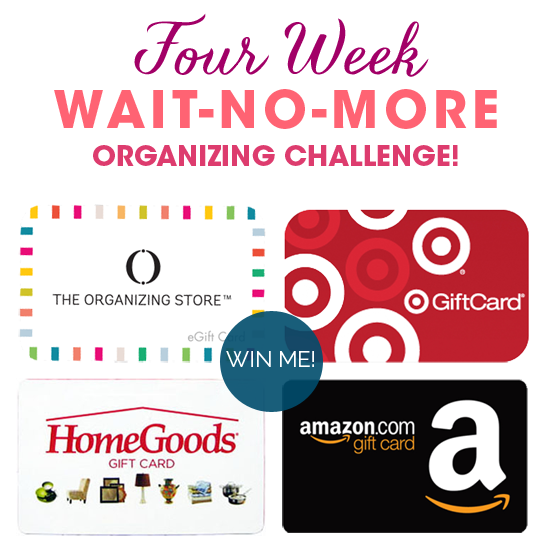 IHeart Organizing: Four Week "Wait-No-More" Organizing Challenge! 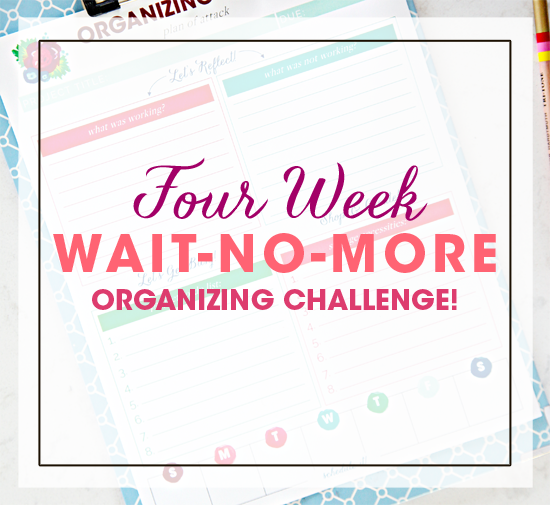 97 Four Week "Wait-No-More" Organizing Challenge! When it fact, that really has never been our style. Although we will forever have problem spaces lingering, we have always prided ourselves on our ability to stay on top of our home. Whether it be with cleaning plans or meal plans or organized kits and caddies galore, our systems have been years in the making. 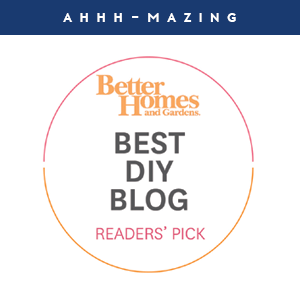 Our goal is not perfection; our friends, family and neighbors have definitely seen our home in a tornado-esque state... We just love to find ways to make our routines easier (and our home prettier). But wow. Over the course of the last five months and being knee deep in a home renovation, we have somehow lost our way. It is amazing how quickly we can fall out of our routines, create piles, and let our daily chores slide. And not having storage in the main areas of our home for many months, has had a trickle effect to almost every other room in our home. The moment we took down our wall and tore apart our kitchen, not only did we remove a few systems that we heavily relied on, we also shifted our priorities. Suddenly everything else could wait and getting our kitchen / living room finished was more important. It feels as though we are always focusing on some sort of project or running here and there. And when we have a few spare seconds, we want to spend them with the boys, not cleaning or doing more house chores. Always a balancing act right? Well, it has gotten to a point that the kids have forgotten what their daily responsibilities are and I can't seem to focus on a single thing due to all of the chaos going on around me. I have always been one to thrive when my surroundings are clean and clutter free, so as the months have gone by, my drive has slowed down. I am totally, completely overwhelmed with our home. There, I said it. I already feel better. Say it with me? Just saying it is the first step. I decided that I don't care that the kitchen still needs trim and the spices need to be labeled. The rest of the house needs my attention. It is time to take back control of a few spaces that have been controlling us, and our moods. I am not waiting any longer! For the next four weeks, I am going to tackle our top four trouble areas. And I am not talking about the garage, which definitely has seen better days, I am talking about the spaces we use all of the time and have a real impact on our days. Although I typically look for some sort of motivator when it comes to organizing a drawer, closet or entire room... this time, my motivator is quality of life! Not crafting or painting or listening to an audio book while I sort. Those are the perks, but not the drivers this time. But that doesn't mean I can't find ways to make it fun, stay on track, and be sure that I achieve my goals. So I put together a printable to get myself started. And because I plan to bribe you all to organize with me, I am giving you this printable for free here. Using the form is really straight forward, but I thought I would show you an example of how it will help with each project I take on over the next few weeks. The example shown above is filled out for our Master Bathroom project. An important part of the process was also to set some sort of a due date goal. Because I want to tackle a new space each week, I selected the first Friday as my due date to complete the space. Before just diving in, I really want to reflect on why the spaces got so bad. Sure, a lot of it is because we have just been too busy to maintain them. But I also questioned whether it is because we are just not utilizing our existing systems, or if the existing systems are truly failing us (and most of the time it is both). It is important to recognize both the good and the bad here; list out things that are working, and think about those yay-areas as you also reflect on what is not working. Now that I know what is not working, I can start coming up with a plan for the organizing project. Things like addressing my make-up storage and dealing with too many un-used toiletries. And of course, each project always starts out with a good blank slate, a deep cleaning and a purging of clutter. 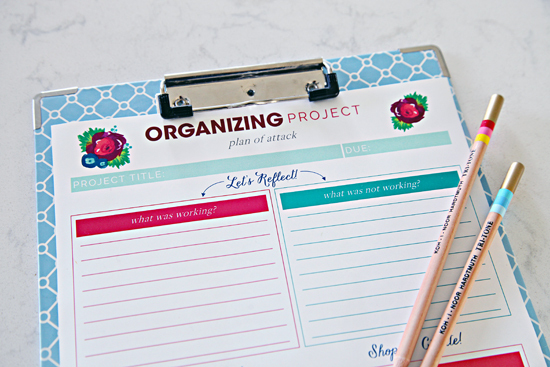 There is also a section on the printable to list out any organizational and storage needs. This is a good time to think about items you already own, what you can easily DIY, and what you may need to purchase. And last but not least, give yourself some realistic goals to strive for over the course of each week. It is a busy time of the year with kids getting out of school, nightly sports and picnic dates at the park. 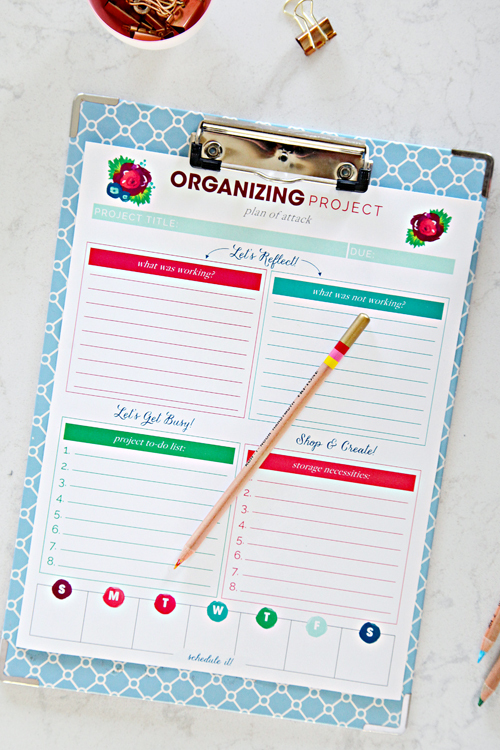 So match up the Project Planner Printable with your personal calendar and utilize the space at the bottom of the form to schedule in your organizing tasks. There! Not so bad! We have already recognized and planned! We are halfway there! And because things are about to get real, and we are going to be ruthless, I got out my handy sorting signs! I printed them, cut them, glued them to colored cardstock and pushed them through my laminator. Now, I can just clip them to any box, bin or basket during a good organizing session. Did I just hear that you would like a set for your organizing sessions as well? You can download the Sorting Signs for free here. 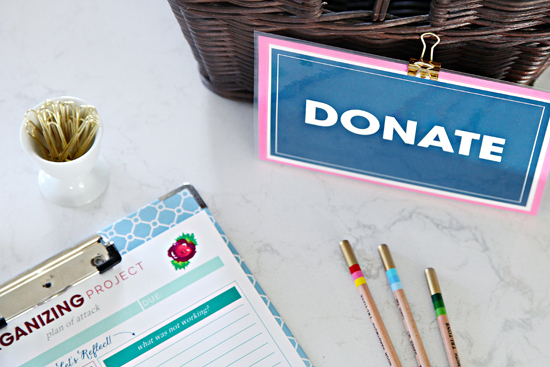 And if you are looking for more printables to help during the sorting, donating and decision making process, you can find my Donation Kit here. Now for the REALLY fun part! My goal is to share my personal results with you each Friday. When I do, I am going to provide a place for you to link your project back to me! You don't need to have a blog to play along, you will be able to link from Instagram as well as other photo sharing sites. And remember that I said I was also going to bribe you to participate in this challenge with me? 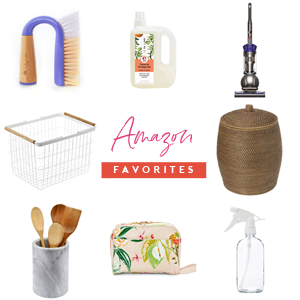 Because sometimes our own messes aren't motivation enough, I am going to use random.org to select one person from the link party each week to win a $50.00 Gift Card to one of my favorite organizing-friendly stores (no need to participate each week to win). Not sponsored, just my personal way of saying THANK YOU for hanging out with me. The fun starts next week! I am not sure which space I will tackle first, but it is on! I can't wait to see what projects you all select. So get out your sorting bins, print off your worksheet and labels and get ready to tackle the organizing projects you have been putting off for far too long. Your "Monica" closet is calling your name! You in? 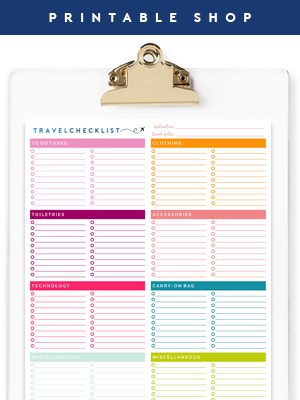 This printable is great! Once I have coloured ink I'm totally printing it out. Thanks. Hey Jen, I've been reading your blog for some months now and this seems like the right time for a first comment....this challenge is arriving just right for me as I have a few problem spots to tackle. I have used the "We just moved in" excuse for way too long and it's time to finally finish all the spaces we kinda forgot about after the actual move. I do have a (new) blog but I blog in German so that probably rules it out...but I actually thought I could do bilingual posts anyway...or I'll just participate via Instagram. What an awesome challenge! And good for you for seeing something wasn't working and tackling it head on! Cheers to getting your space back! Me too.. I soo need my craft space back!! Oh Jen! You are reading my mind! I'm a wedding planner and florist, and pride myself on keeping other people and myself organized. BUT, every time I get to this time of year (aka wedding season), things go by the wayside. I'm on board! Thanks for the inspiration!!! I can't wait to get featured here some day. My wedding supply pile (of all my floral and planning supplies), is lovingly referred to be me as my "Monica closet." And thanks for the printables: would you mind sharing your other problem areas' examples? Sure thing! I will share each week with the task I am tackling. :) xo! I'm in! Thanks for the free printables! WOW - this came at just the right time for me - I reorganised my pantry today, but still have other areas that need doing! I am definitely playing along (here in Australia!). I'll be starting on my boys room on Friday (wish me luck, it's like a post-apocalyptic war zone in there!). Good luck Lee! You can do it! Great areas to focus on! I love this. We are normally organized people, but our systems, too, have begun to fall by the wayside. Summer is already kicking me in the pants two short weeks in (will it ever be possible for my kids to be home during the day and our house to look decent?)! This is just the motivation I need! So excited!!! I needed this to get motivated. Thanks for the printable. I love how pretty it is. I'm with ya girl!! I need this!! Thank you for all that you do!! My "Monica" office is calling me!!!! Awesome! I've got 6 weeks before baby is due so some major nesting can go on in there 4 weeks!! How fun! 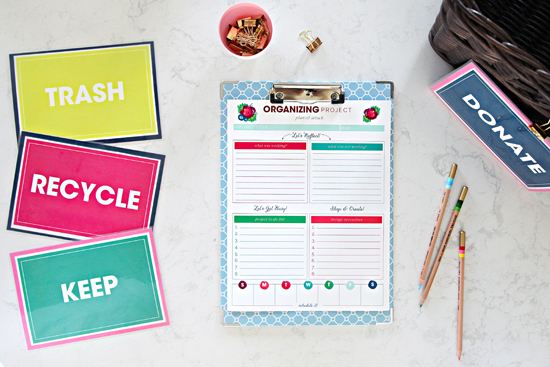 I love how you make organizing fun and pretty! Ooh, I like this. We are starting major extension works to our property, so the timing is too soon for me to join in. We are living with a crock pot/ no hot water/ gas/ dust for 3 months, put I will revisit this when we are back on track! Good luck and happy sorting! These printables are so pretty! Thank you for sharing!! I am downsizing (I am calling it "right"sizing instead!) from a 5 bedroom/4.5 bath house to a 3BR/2BA condo next week. I need to reorganize my already well organized home in a smaller setting. This challenge came just in time. I have printed 4 of the printable sheets for the the following areas: Linen closet, bathroom, office and kitchen! Great picks! I hope your move is smooth sailing! This is the exact motivation I needed to kick start my summer! I am so excited and have already started my plan. This is music to my ears! Over the last three-ish months, my husband and I have been scraping the popcorn ceilings and repainting our entire house. There is dust everywhere, and nothing is where it goes. I thrive on organization and cleanliness, so I feel like I'm going crazy! I can't wait to have my house back, new and improved, along with my sanity! Thanks for all the inspiration you give! I have so much sympathy for your situation right now! Completely changes how you use your home going through those large projects. And the dust! Best of luck to you! Thank You! Love the printable. 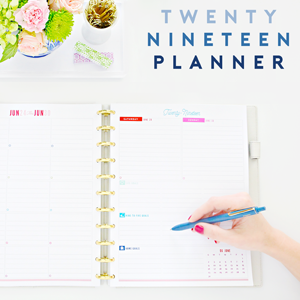 Can't wait to see the planner! This is just in time. I am hitting my busy season and my office and workflow is a mess. This challenge will definitely help me get back on track! I need this!! I'm moving from Michigan to New Jersey (and for the first time with a baby!) in 3 weeks. Yikes. I hope it all goes well Sharon! That is quite the haul! I so need this! Lately I've been feeling a total lack of control over the condition of the house. Hopefully, working along with you will provide the motivation and pacing to get back in gear! This might seem insane to you right now... We have a 732 square foot town house. Its always clean and well organized, which is making me jealous!!! Im obsessing over wanting a house to completely reorganize and whip clutter into shape in!! I look around and think "I cant join in this challenge. Stupid, tiny house!" Luckily it's only 90 days until we move to a new town and a new house!! Maybe then i can get my hands dirty. Im already drooling over the friday updates! So excited!! This is super!!!!!!!!! You even know how to organize an organizing project!!!! Hi Jen! I have been reading for just a few weeks but wanted to let you now how MUCH INSPIRATION I have gotten off your website. It has me making MANY CHANGES. 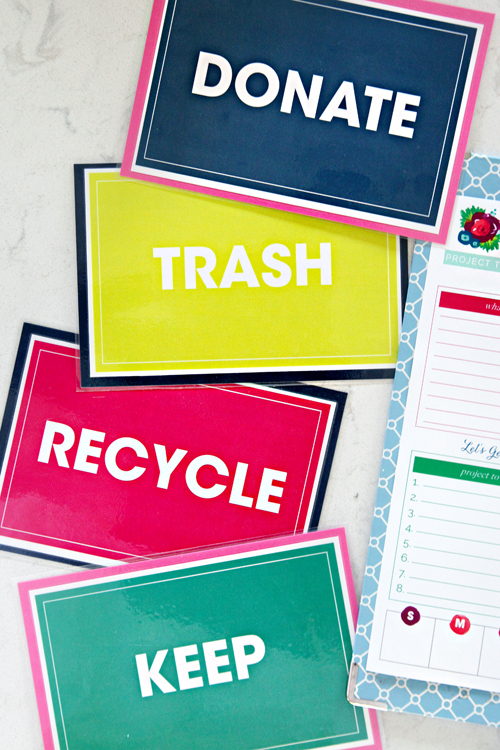 Unfortunately, I have felt overwhelmed with the number of areas of our home that desperately need reworking so today's post (and FREE printables) are just what I need! Thank you so much!! I also have a question. Our garage is pretty high on my list and I was wondering if you could tell me where you got the bench & shelf you are using to organize sports equipment (the stuff near the door to your home). I splurged on something similar from Pottery Barn for an unused corner in our front entry way but wouldn't want to spend that kind of money in our garage so looking for a cheaper alternative. We still love it, I would just raise the bench from the floor slightly with small plastic legs or a waterproof base. Ours has started to swell after a few years of cold/wet weather. "Fail to plan is planning to fail" thanks so much for this idea! You are spot on that there are systems in my house in a major slump and what better way to focus my energies than to challenge myself? So, bravely, mine are: menu/meal planning, financial paperwork, weekly schedule/chores, and my supplies cabinets for crafting and play time. Now I've listed it, motivates me to get serious. Thanks!! Good luck Hannah! Excited you are joining in! Wonderful! Just what I need to jump into summer! I already have it on my Pink striped clipboard! This might just finally motivate me to go through the paperwork in my office. I have good systems in place. I just lack motivation, but this time it's gone on waaaaay too long! Thanks for the encouragement. I have been feeling exactly the same and have been challenging myself on my blog the last few weeks with a weekly organising task. This sounds like much more fun so I'll definitely be joining you!! Can't wait to see what everyone comes up with! I love that you are breaking down a big space into smaller, bite sized projects. Thank you for joining in on the challenge and good luck! xoxo! Yes, I'm in. It's just the kick in the pants I needed. I live in more chaos than is probably healthy and enjoy gleaning tips from you. There are many basic organizing tips that can be applied everywhere once learned. Yikes, It feels like they all need to addressed immediately! Realistically they will get done quicker if I focus on one at a time though, right? Hi Janet! Yes, definitely take it one project at a time. And if the basement is a larger project, even considering tackling small zones or areas each week instead of taking on the entire thing at once. Celebrate your smaller accomplishments! xo! This is what I love about you, Jen. You've taught us that organizing is an ever-evolving thing and even if the whole home isnt in gear, just focus on one area at a time it make it work. My home is far from organized, because over the last few years dealing with a really bad back that has put me out of work, my "good" days are spent catching up on housework, but when I get to implement even one little bin to help with an organizing issue, I feel like i've conquered he world!!! This challenge im going to try and focus on a few small projects. A jewelery organizing board and redoing my linen closet! YES! Just in time, my summer vacation starts on Monday and I'll finally have time to do some much needed home organization! Great selections! And happy you are playing along, best of luck and happy summer vacation! Thanks for the awesome printable Jen. This is exactly what I needed right now. So glad to hear you are joining in! Best of luck over the next few weeks! Perfect timing! Big chest freezer in the garage? Here I come! Great post, Jen! I need help to also take back my house! I have a lot of health problems, so many times the motivation is just not there, but I need to pick myself up and just.get.it.done! Thanks for the handy dandy printables! Also, thanks for the challenge; it is just what I needed. Looking forward to this journey! I was all set to have a garage sale this spring and I cleaned out a closet. Then I decided I wanted to change the way I stored things in the kitchen so the closet I had just emptied became a sort of pantry for all those occasionally used appliances. I also decided I didn't want to take the time it takes to have a garage sale. So I donated everything to my church for their sale. Twice the blessings! I hope this isn't a rude question - but what is the name of that adorable font you used for the "Let's Reflect", etc? It's perfect! I am giddy with excitement at the idea of getting started this weekend - so thank you! Oh yeah, my four areas are home office, laundry room, daughter's closet and baby closet. I love how you threw in "Monica" closet :) Friends is the best show ever. I would love to get in on this challenge. So many things that can be done! Love. It. :) My goodness we really do ALL have Monica closets. Posts like this are why I heart you and your blog so much Jenn! Thanks for getting us all on track! Perfect timing for this. I can't wait to see your progress. I always find your smaller organizing tasks very motivating! I had a mini (well, maybe big) hissy fit in front of my husband and kids this morning that started with my son not being able to find his library book that I escalated into the usual "why am I always the only one who EVER puts ANYTHING away!" and then to the usual feeling of not being able to keep up with my own life! time to get organized! I am going to move out of my house and moving in into another. You can't imagine how many useless stuff I found when I started decluttering all of the rooms. I think that I should organize something as a garage sale for some of my stuff because I don't want to bring so many useless stuff in my new home. I think that every home reach to the point when it is cluttered and disorganized. I'm in. Bedroom and bathroom. I have before photos--not sure if I'll have the courage to post them. I suppose it depends on the after photos! I so need this...my motivation comes in fits and starts and all I want to do right now is watch Grace and Frankie and play on Pinterest. I got about 3/4 of the way through a KonMari purge of my whole house and then stopped. External motivation to the rescue! My areas are: master bath/toiletry closet, my daughter's closet, office, craft closet. Thanks for the nudge! I love this! And it is perfect timing for me too. I have a hard time focusing and staying motivated when everything is a mess too. But, I was trying to print the planning printable and every time I try my printer thinks for a long time (more then usual) and then it only spits out a blank page. I was able to print the box labels though. Any thoughts on that? Thanks! This is good timing for me. My son and grandchildren will be here in six weeks and the house is a disaster zone! I want to get it decluttered, cleaned, and manageable before they get here. This just might be the kick in the pants I need! Now where to start!!! Great motivation post Jen! Like you, we have been knee deep in a a lower level reno for the past year. This includes a bedroom, powder room, dining room, family room and kitchen. Hopefully within a month or so, it will be COMPETE!! However until then, I am not going to lie, its HARD having a family and living in a renovation zone. I have 4 amazing boys and since we started the lower level my upstairs has become a wreck. We all have gotten lazy and fell off key but I am ready to join the forces and get my organized life back. Cant wait to get started!! Perfect timing! This end of school-year thing, even just with a preschooler, has become so crazy and the papers have piled up over the year and it's time to reclaim my desk! Well, that's Week One, at least, annnnnd, maybe Week Two, also. Sigh. So inspired -- I'm VERY pregnant (baby is coming next Friday) -- so all of my momentum in my house has ground to a halt. Add in dance recital, kids' summer school program and baseball season, I feel like I'm drowning in undone to-dos. 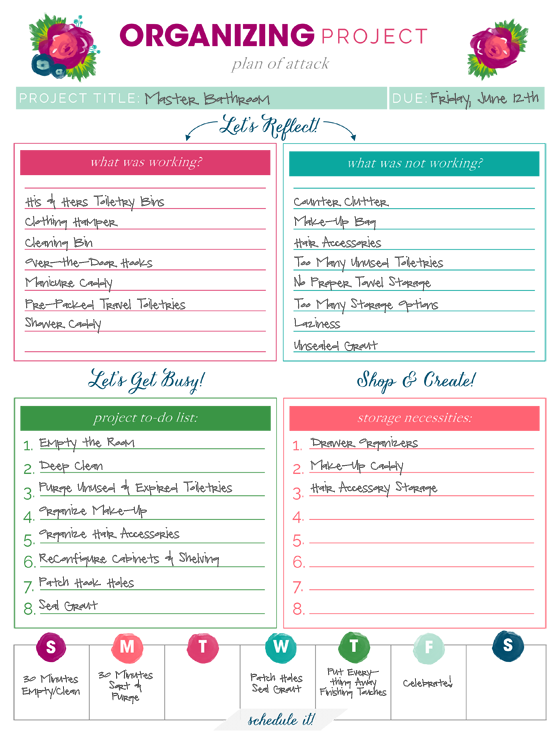 Your printables are going to let me start planning, so that once my new little one is here (and I can bend over again) I can really tackle the main problem areas so we're ready for the new school year. Our very tiny front entry and closet are at the top of my list. With the "pregnancy brain" I've had the last few weeks, I've barely been able to focus on a to-do list, let alone anything more in depth. Thanks for being so inspiring! We are getting more and more organized, but having twins has put a halt on the house (now 2 months old). My husband was motivated to get organized and home improvements done while I was pregnant, but I was on bedrest for 8 weeks. I would like to do mini projects that are not too demanding or time consuming, but have an impact on our daily routine. My spaces are the daily mail / command station, my office, junk drawer, and guest bathroom (which I'm claiming as soon as it's done). Here's to small projects to keep the momentum going! I'm Monica...seriously. My intent was to read your post to get inspired and I find it has my name at the end! So, my piano studio was just overtaken by my middle son to give him an "apartment" space. The library/school room is full of the piano "stuff", along with the homeschool books and papers. This room has two "Monica" closets and bookshelves. The whole month may be taken up by this project. So very excited about this challenge! I stumbled upon your blog a week or so ago and I'm completely hooked! 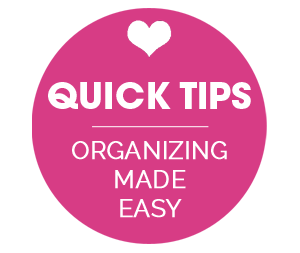 Love everything you post and how you're an "organizer at heart" like myself. I'm getting ready to move in early July (to a similarly laid out apt), and this will give me some great motivation to pair down and get things to work and function better! I will definitely update once the kitchen finishes are done. Shouldn't be too much longer now I hope! xo! Hi Jen! I love your blog! And I totally understand what you mean about how routines and responsibilities can kind of go off the rails when your environment is disrupted, like during a renovation. I'm in the process of moving, and I'm housesitting until I find and move into a new place, and having so much up in the air has totally thrown me off! I love the challenge you set up, and I think I'll do it with you! And if you get a chance, check out my site--I just started out as an organization and home design blogger! This will definitely motivate me to get some organizing done! I have a huge to-do list but this should help me get some of the big stuff checked off my list. I plan to do the linen closet, pantry, bathroom, and my sons' closet. I can't wait to show you the pictures when I'm done! Am I too late to join in? Thanks so much for all your organization techniques - the printables are soooo helpful to me as a new work from home mom! Question - where did you get those colored pencils from? Color organizing is best! I would love to have those to fill in my daily tasks! I have a few sets that the kids and I love; one from Target, one from Michaels and the ones pictured are from Anthropologie. This printable is awesome! I've already started filling out one for my bedroom and one for my kitchen. Thank you so much for sharing it for FREE! Really enjoy your blog and get so much inspiration to get my home totally organized. I'm well on my way! Gorgeous! Would love to see a tutorial on how you wear your scarfs. They are all so pretty!! I LO.....am OBSESSED... with your blog and printables but none of the links are working. I keep getting an error code. HELP, PLEASE!! It works best to go here (https://app.box.com/s/6ccw426rjtyehhgk4lt9nkrd87842ag7), click the blue "Download" button and save the file to your computer. Then it can be opened using Adobe Reader (or another PDF reader) and printed from there.